Opening later this year is the refurbishment of the disused retail space (Millers equestrian centre). Displaying a selection of wood flooring, natural stone wall and floor finishes, carpets, garden furtniture, kitchens, homeware, stoves and the all new restaurant. This project is the conversion of an existing derelict Granary in Aberdeenshire into a 3 bedroom house utilising the existing granite stone and using complementary materials such as timber cladding to rebuild the Granary. The existing openings are defined with large sections of glazing, framing the attractive Aberdeenshire countryside. Ground floor rear extension creating open plan kitchen dining opening out to the landscaped garden. The existing City centre town house is to be completely renovated, converting the attic space into a large bedroom and ensuite, with the formation of a box dormer. At ground floor there is a spacious extension finished in white render with full height glazing maximising the view to the garden, and creating a light and airy space. This extension is designed using a combination of smooth white render and timber cladding to create an open plan kitchen dining area, that steps down to the living area that opens out to the garden. 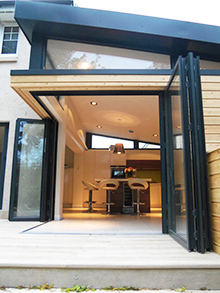 This project is a ground floor rear extension and complementary Dab Den garden room at the bottom of the garden. Interior renovation of the office interior in central Aberdeen. The company wanted to design the interior with their logos and their corporate colours and branding. Interior fit out of the existing bar and restaurant in central Aberdeen. Interior renovation and change of use for a coffeeshop in the west end of Aberdeen. Change of use from residential to offices with Interior renovation of the the office interior in central Aberdeen. 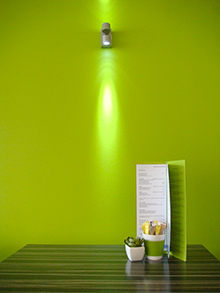 The company wanted to design the interior highlighting their corporate colours and brand. Copyright © 2013 Dab Architecture. All Rights Reserved.